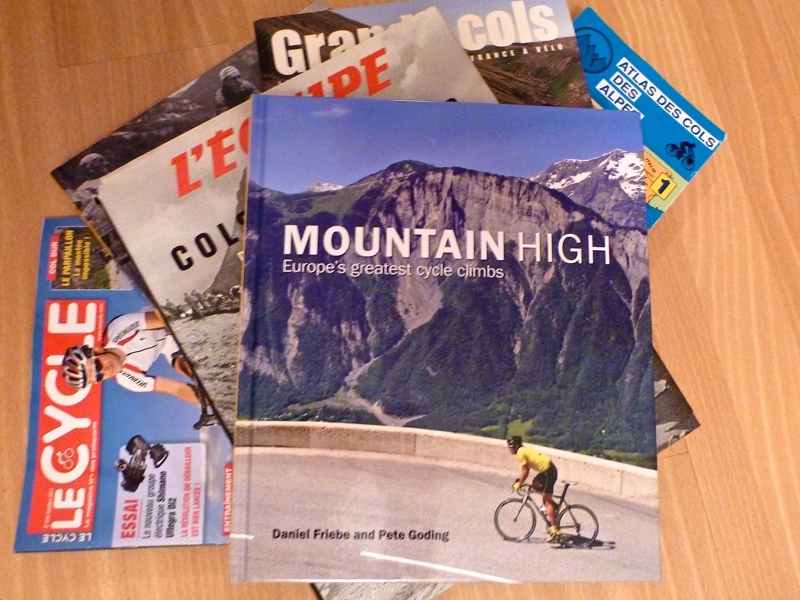 “Mountain High – Europes Greatest Cycle Climbs” by Daniel Friebe and Pete Goding is a book that I would have loved to have written. It’s currently on sale at amazon.co.uk for just £10 – a steal. There are guidebooks to alpine climbs, there are “coffee table” cycling books, and there are books about pro cycling. The book profiles 50 Climbs. Any list of the best 50 climbs in Europe will have some controversial choices. But I think Friebe chooses a compelling list. At the bottom of the page is an interactive Google Map of all 50 climbs coloured by country. If you click on the pins I have added links to trip reports for roughly half fo the climbs. The book discusses the climbs sequentially by altitude. The first few climbs are tiny – and to an alps snob like me – a little uninteresting. But they are hugely famous. He selects them from several of the most famous one day races. For example: Koppenberg & Muur (Tour of Flanders), La Redoute (Liège-Bastogne-Liège), Cipressa, (Milan-San Remo), Mur de Huy (Flèche Wallone), Il Ghisallo (Tour of Lombardy). It’s tough to argue with such a legendary list. Update: The authors have published a seuqel: “Mountain Higher. It deals with less famous, more “undiscovered” climbs. Frankly, it is fabulous. As the list progresses the list gets more and more interesting. 7 Countries are includes: Belgium, France, Italy, Spain, Switzerland, Austria, and Andorra. Many of the climbs will be familiar to Col hunters: Galibier, Gavia, Tourmalet, Alpe d’Huez, Stelvio, Finestre, Madeleine, Iseran, Mortirolo, Glandon, GrossGlockner, Zoncolan, Angliru, etc. But the list is sure to contain several pleasant surprises for almost everyone. Number one on my list: Cirque de Gavarnie in the Pyrenées is new to me and sounds fantastic. What’s missing? First, his only Jura mountains selection (my backyard) was hugely disappointing: Col de la Faucille. I can think of a dozen better climbs nearby. Not least of all the Jura giants Col du Grand Colombier or Mont du Chat. The author told me he selected Faucille for it’s views of Mont Blanc (which are good). Also, Switzerland is hugely under-represented with only the fantastic St. Gothhard Pass (and one side of Grand St. Bernard). The author told me this was due to the lack of race history here – but I think this is a hole in an otherwise pretty good list. As I’ve written a few times before, some of the big climbs in Switzerland are as good or better than anything in France. The photos by Peter Goding are very good. And there are lots for every climb. Lots of people will love the book for the photography alone. But honestly, a little part of me was slightly disappointed. I wanted more 2-page, huge, epic photos. Or better lighting – on average the photos seemed dark. This is certainly not the best cycling “coffee table” book in my collection – but again it’s very good. FWIW, probably my favourite is the French “Cols Mythique” by L”Equipe. I think Friebe does an admirable job of accomplishing this goal. He knows his climbs – but doesn’t waste time describing each kilometre. Most of the climbs, of course, include a discussion of their pro-cycling history. Lots of good stories. But the author also tries hard to give a feel for the geography and history of each location, as well as any other interesting stories of the climb even if tangential to cycling. Reading each chapter is a fun 15 minute journey. Here I think this book shines. The authors have chosen a simple but effective layout. 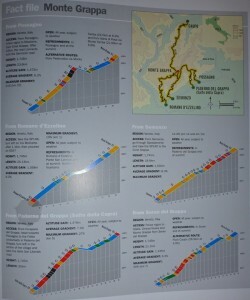 Each climb has a section with climb details (see photo above): A simple map with info like start towns. An elevation profile for each climb. 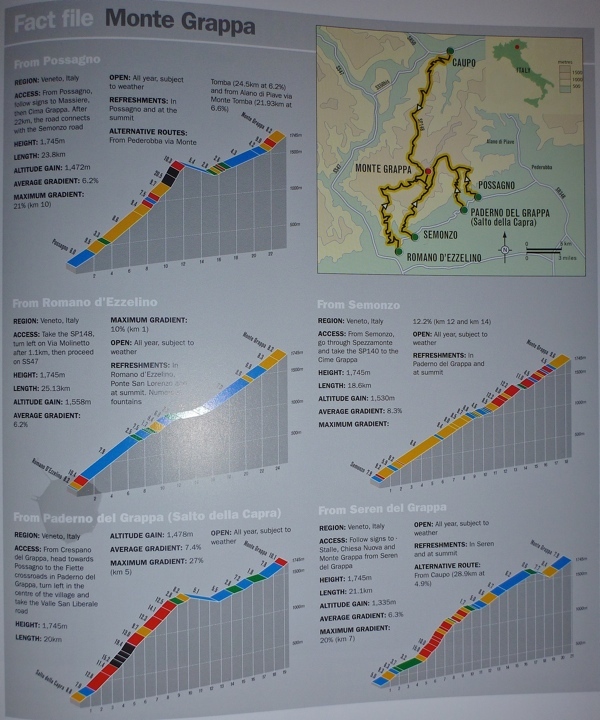 And some additional info like simple directions to the start, climb data (average, max grade), etc. And for me, best of all. They cover EVERY important side for each climb. This puts them ahead of many other books. My goodnesss, Monte Grappe profiles 5 sides. As a cyclo-tourist this is fairly awesome. Too many people, for example, climb the “famous” side of Stelvio without realizing that the back side is also one of the very best climbs anywhere – in its own right. The rounded pins are some of the climbs from the sequel. Click pins, roughly half the climbs have links to trip reports. There are guidebooks to alpine climbs, there are "coffee table" cycling books, and there are books about pro cycling. Mountain High attempts to be all three - and broadly succeeds. I also like the Le Cycle’s monthly Col Dur and the partially obscured and now out of print French book in your photo Grands cols. Le Cycle’s “Col Dur” selections have been fantastic recently. Do you subscribe? Agreed, a volume two would be great. That “Grand Cols” book is a good example of a fairly good book that – unlike “Mountain High” – only bothers to give profile and ride details on one side of each climb reviewed. I received this book for Christmas from Kim. I love reading the stories and the history behind the climbs. It is proudly displayed on my coffee table! Gives me some motivation on future “cols to conquer” the next time I get back to Europe! I just tumbled over your website and it looks good. Many good stories and climbs. I agree about your review of “Mountain High”. It´s a good book although they could have made the photos bigger and lighter. these climbs. For instance: la marmotte includes Galibier, Croix de Fer and Alpe d´Huez. but I also like to be part of a big ride, competing on that level where 60 years oldies with Parkinson compete. The Monte grappa Challenge. 8100 altitudemeters in one day if you ride all 5 climbs. I have ridden MGC twice but only made three climbs. It´s tough but its a beauty and a with view over the Po-plain! Fantastic. It´s the 14. of July 2012 in Bassano del Grappa.